Western New York Perinatal Bereavement Network is a very worthy organization that helps to assist our community in meeting the needs of people facing perinatal death. The Network hosted a fund-raising raffle event last weekend. Pictured is the quilt I made to be donated as one of the raffle items. It is extremely simple, but very effective. The center fabric is a single cut of bright, eye-catching fabric that is surrounded by complimentary borders. Yes, that is all there is to the quilt! When you look at the center fabric, you can see that cutting the fabric into pieces for quilt blocks would not be an effective use of such a dynamic piece of fabric. It took me longer to get the quilt to my amazing quilters Kathy and Kris at Chasen Dreams Quilting!! Do you have a beautiful piece of fabric you just can’t cut? Then this quilt might just be the answer!! Fast and easy to make bibs will help keep toddlers clean while they are learning to feed themselves. The bibs cover the entire front of the toddler and can be used to clean-up the area when they finish eating. 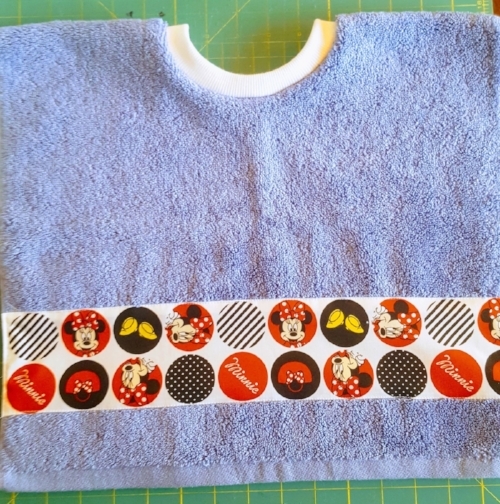 Make the bibs using dish towels or hand towels (approximately 16” x 27”). Hint: check out the clearance sections of stores for inexpensive towels. The two bibs displayed are made from dish towels I found on clearance at JoAnn Fabrics. T.J. Maxx and HomeGoods are also great resources. The bib can be sized down for an infant by using fingertip towels instead of the dish or hand towels. Supplies: 1 towel, 2” of rib knit fabric (sold by the yard), marking pen, and basic sewing supplies. Find a bowl or cup with a 5” (4” for infant) opening. This will be used to mark the neck opening on the towel. Place the bowl on the towel’s center. Using a marking pen, draw around the outside of the bowl. Cut out the neckline opening. Divide and mark the neckline opening into fourths. 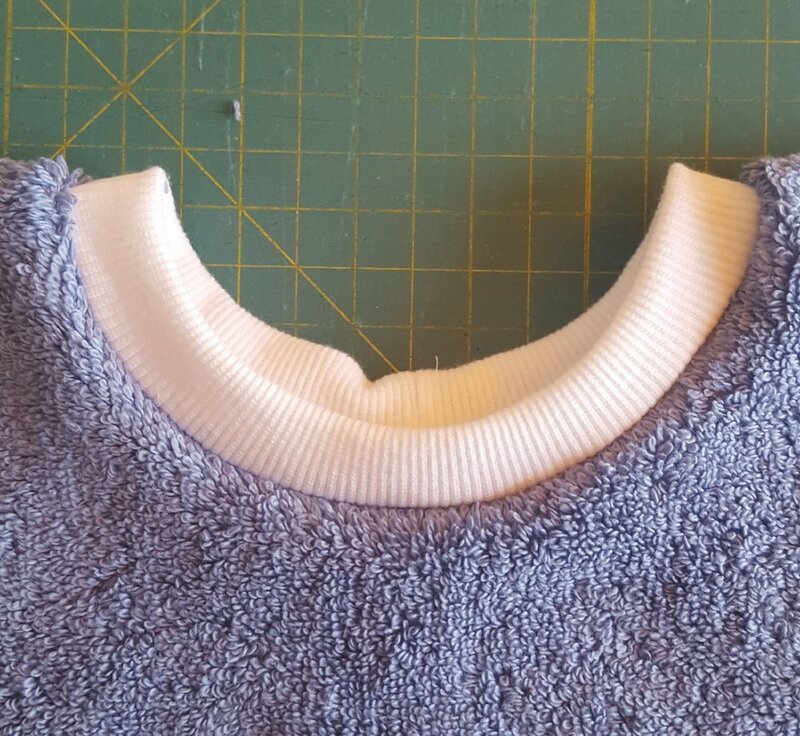 Cut the rib knit fabric for the neckline, 2” x 13 ½” (2” x 11 ½” for infant). Stitch the short ends of the rib knit together with a ¼” seam allowance. Finger-press the seam open. Divide and mark the rib knit into fourths. Fold the rib knit in-half, place the raw edges of the rib knit to the raw edges of the towel’s right-side. Match the markings on the rib knit to the markings on the towel. The rib knit will need to stretch to fit the markings on the towel. Prepare to stitch the ribbing to the neckline of the towel. Set your machine for a wide zigzag stitch with a medium stitch length, a serger can be used for this step if you prefer. Place the bib under the presser foot, towel side facing down. Begin stitching slowly, while gently pulling the rib knit to “fit” the opening of the neckline. Zigzag stitch through all three layers. Clip the threads and you’re done!! Yes, there are only 136 days until Christmas. If you are like me, you have 136 projects you would like to complete before the holidays. 136 days may sound like a lot of days; I mean it is summer and we are just two-thirds of the way through the year. Consider these thoughts, we have three major holidays leading up to Christmas; Labor Day, Halloween, and Thanksgiving. You know you are going to want new place-mats with matching napkins for Labor Day. Halloween…what can I say? Everything Halloween is fun and I want to sew it all; a quilt, basket liners, table runner, another quilt, pillows to match the quilt, a wall hanging. You get the idea, I enjoy sewing for Halloween! Thanksgiving the family is coming to your house, so you decided to re-do EVERYTHING; new curtains, seat cushions, another quilt, hot pads, apron, tablecloth with of course matching napkins! Do you see where I am going with this? We might want to start thinking Christmas and the gifts we believe we are going to create and stitch. We want Joy, Joy, Joy, not stress. 136 days, a project a day, great!! Grab a pen and notepad - Jot down all of the people on your gift list. Brainstorm what gifts you would like to create for each person or any items you would like to create just for fun. Print calendar pages from now until December; fill-in the weeks with projects you would like to complete. Include when you plan to start the project and when you would like the project completed. Estimate the amount of time for each project; include gathering the project’s supplies, either from your stash or shopping time. Doing this now will give you a snapshot of what you need to do to see your gifts wrapped and under the tree before Christmas Eve! It will also allow you to prioritize what projects are a must and maybe some that can wait until after the holidays. Now you have an outline of how your goals can be achieved for this coming holiday season! Have you ever wandered out your front door or into your backyard, only to notice that the pillows and cushions on your outdoor furniture have traveled three doors down the street to your neighbor’s yard? It was happening to me almost daily! Part of the reason is we live at the eastern end of Lake Erie, just outside of Buffalo, New York. The wind whips across the lake and up the hill all year long. Taking the pillows and tossing them to and fro across the neighborhood. I was ready to staple the pillows to our chairs, because you know I wouldn’t bring them in each night or if there was a storm on the horizon! Dig through your stash of ribbons and pick out any grosgrain ribbons that are about 1” to 1 ½” in width, and that compliments or matches your pillows and cushions. For the best length, place the pillow on the chair or chaise lounge and measure the length needed for each ribbon to be tied into a bow. Fold the ribbon in half and stitch it by hand or machine to the pillow top at the center seam. Or, you can open the seam slightly and insert the ribbon tie into the seam, stitching the seam closed, while securing the ribbon ties into the seam. I found that just stitching the ribbon to the top of the pillow works well. For chaise lounge chairs, the ribbon ties may need to be secured to the bottom edge of the pillows near the lower corners. Doing this to each pillow outside has alleviated the seek-n-find game we played almost daily! Recently, I had the privilege to work on a lovely project with artist J. Wecker Frisch owner of Tidings of Great Joy . Janet has a creative spirit, which can be seen in all that she touches. Janet’s Handmaids® collection is a delight! Working with Janet’s artwork for Machine Maid, I was able to create a life sized raw-edged appliquéd quilted panel. When completed, she measured 60” tall! Janet debuted the Handmaids® collection of appliqué patterns at Spring Quilt Market in St. Louis, Missouri. The vintage look of Machine Maid is charming. All of the fabrics used for this project are from Janet’s fabric collection She Who Sews. Janet’s artwork has been translated on to cotton fabrics by Quilting Treasures. Her fabrics are available at your local independent quilt shop. P.S. 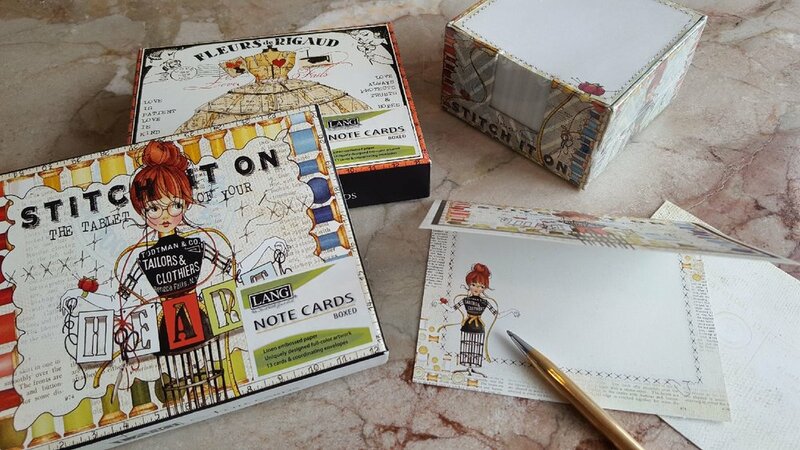 - Janet’s artwork can also be seen on many other products such as note cards, journals, and calendars. I purchased these at Jo-Ann. So, pretty! A little quilting, a little embroidery…Cupid’s Valentine Gift for you or your love! KISS. The font I used is built into many Baby Lock Sewing Machines, it measures 5 ½” tall, but any font would work. Now, prepare and program the machine for embroidery, hoop the white cotton fabric and stabilizer, stitch out the selected word design. Gently, remove the stabilizer. From the scraps of Valentine fabrics, cut twelve 2 ½” x 2 ½” squares. Randomly lay the squares out into four rows of three squares each. Stitch the squares together into four rows; using a ¼” seam allowance, press the seams. Stitch the rows together and press well. Measure the finished size of the patch work; mine measured 8 ½” x 6 ½”. Use the 8 ½” measurement for the height when cutting out the embroidered letters. The length will vary depending on the word you embroidered, my length was 14”, and I cut the letter section 8 ½” x 14”. Stitch the letter panel to the patchwork and press well. Mark the patchwork for quilting. Layer the pillow top and a piece of quilt batting, baste the layers together. Quilt the patchwork section of the pillow top. Baste the rickrack to the pillow top edge, centering the rickrack over the ¼” seam allowance. Measure the pillow top and cut a pillow back using this measurement. Mine measured 8 ½” x 20”. Place the pillow front and back together, with right sides facing, pin securely. Once pinned, stitch the pillow together with a ¼” seam allowance. Leave an opening at the bottom edge, to allow for turning the pillow right sides out. Turn out the pillow and press. Stuff the pillow with fiberfill. Pin the small opening closed and hand-stitch with matching thread. The New Year always inspires me. The opportunity to bring back a small amount of order in my life and focus is rewarding. Often, I become sidetracked, but anything I accomplish toward order and focus, I consider a bonus! My personal challenge in 2017 is, “What can I do?” It is a small question with mostly wonderful consequences, asked of anyone that may cross your path. In a short amount of time I have been amazed at the overwhelmingly positive response to this simple question. Recently, I asked my friends, aka. quilters, for help with a charity project. They said, “yes” and we are now supporting Western New York Perinatal Bereavement Network. Their mission is to assist the community in meeting the needs of people facing perinatal death, the death of a baby from miscarriage, ectopic pregnancy, stillbirth or early infant death. As the mother of three healthy children, I can only imagine the love these families have for their babies and cannot even begin to imagine the grief of these families, when for whatever reason their precious babies are taken. There is a small group of us that meet and work on items requested by WNY Perinatal Bereavement Network to provide to their families; tiny burial gowns, burial pouches, and small memorial envelopes. When we first came together to work on this project, we shed tears. It was difficult to think of the loss and the grief of these precious parents. We work to create tiny items of beauty to help in some small way. We use items that have been mostly donated like: wedding gowns we cut into the small envelopes, gowns, and pouches to be sewn, along with beads and ribbons. And all that it could be. And yet we’ll have forever. What can I do? I ask you to consider this as one of your challenges for 2017. See what a difference it will make in the world around you and in your own self! So, I took a long “quick-stitch-break” the past few weeks and collaborated with J. Wecker Frisch from Joy Studio. She is an amazing artist showing her new fabric lines at the International Quilt Market in Houston, TX this week. Janet’s new fabric line, “The Queen of We’en” is being introduced by Quilting Treasures. For my part, I was able to work with fun printed panels from Janet’s newest fabric collection. We designed one large Queen fabric panel into a quilt and four smaller Queen fabric panels into wall hangings. The quilting was kept simple; I used the Baby Lock Sashiko Sewing Machine to do all of the stitching. The Sashiko machine is one of my favorite machines. It is different than any other conventional machine; the machine makes what looks like individual stitches on the quilt. You know, like I hand-stitched the entire project…NOT! To accentuate the Queen quilt and panels, I incorporated one of my favorite fabrics this time of year, burlap with golden accents. Granted burlap is not washable, but these projects and most fall sewing projects are usually just decorative. So, consider adding a little burlap to your next fall project, whether it is in a wall hanging, table runner, or some cute pillows. Don’t forget if you are in Houston for the International Quilt Market, drop by booth number 2534! Check out Janet’s fabrics and all of her unique projects for her collection “Queen of We’en”. Great fun was had this past Saturday at The Buffalo History Museum. Several people joined me for the "Blind Man's Fancy Quilt Block Class" hosted by The Buffalo History Museum. The Blind Man's Fancy Quilt is just one of the many quilts that were donated to the museum by Julia Boyer Reinstein, a dedicated patron of the museum. The original quilt (circa 1880) is currently on display in the museum's quilt exhibit. The quilt is pieced together with a large assortment of beautiful fabrics. All of the blocks are then surrounded by flying geese sashings, over 480 flying geese! Most all of them stitched together in different fabric combinations. This quilt is surely a potpourri of color, pattern, and happiness. It is one of my favorites in the museum's collection. Okay, so we got busy Saturday and created our own little bit of history. Some ladies chose the historical reproduction kits, while others selected the Halloween inspired kits. At first glance, the block appears difficult, but by breaking the block down into sections, everyone successfully completed the block by the end of the day. Just as the blocks in the original antique quilt had variations from block to block, our blocks did too! It was interesting to see the effects of turning sections of the block different directions. Each block looked great when completed! A special "thank you" to the ladies shown here for attending the class and allowing me to photograph them with their completed blocks. A few weeks ago, Megan MacNeill with The Buffalo History Museum asked if I would spend the day sharing some of my quilts with visitors to the museum. Let me tell you, I couldn't respond "YES!!" fast enough! The museum has a great exhibit taking place now with quilts from their vast collection. The day was wonderful, from 10:00 a.m. until 7:00 p.m., all I did was talk about quilts and quilting! I brought along a few of the quilts I made for the upcoming book, they are reproductions of the original historical quilts from the museum's collection. It was fun taking photos of a couple to see the similarities of the historical quilts and my reproductions. My mind was churning after the visit...which historical reproduction to start on next? So many beautiful quilts with interesting stories! Interesting stories?? How do we know these stories? People used journals and shared oral histories to preserve the unique heritage of their quilts that had been documented. Have you labeled your quilts, written in a journal about your quilts? Now, having worked with the museum I see how important this simple step is in preserving the history of our quilts. Stop by The Buffalo History Museum and Say Hi! Welcome to my blog, I am happy you stopped by today. I learned to sew forever ago. Sewing makes me truly happy, I look forward to it every day! Sewing is also what I happen to do for “work”. I am a independent project designer, I design quilting and sewing projects. That being said, I decided to write a book. Of course, the book is about quilting, my favorite type of sewing. For the book, I am collaborating with The Buffalo History Museum. Learning about their quilt collections has been very interesting, more about the book later. Working on the book requires a lot of time at the computer…not my favorite thing, at all!! So, I decided to take a quick-stitch-break today. This is what I made; cloth napkins from my favorite scraps of quilt fabric. Being made from quality quilting fabric, the napkins wash and dry like a dream. I get to see my favorite quilt fabrics at breakfast, lunch, and dinner! And, I feel wonderfully luxurious using cloth napkins, instead of paper. Great gift idea! Make a set of cocktail napkins, tied together with a pretty ribbon and a bottle of wine! Use a rotary cutter and mat to cut the fabric scrap into a square. Zip the square through the serger; stitch a rolled-hem on all four sides of the fabric square. Before trimming the serger tails, apply a dab of seam sealant on each corner. Press the napkin and trim off the serger tails. Repeat often for sets of pretty napkins! 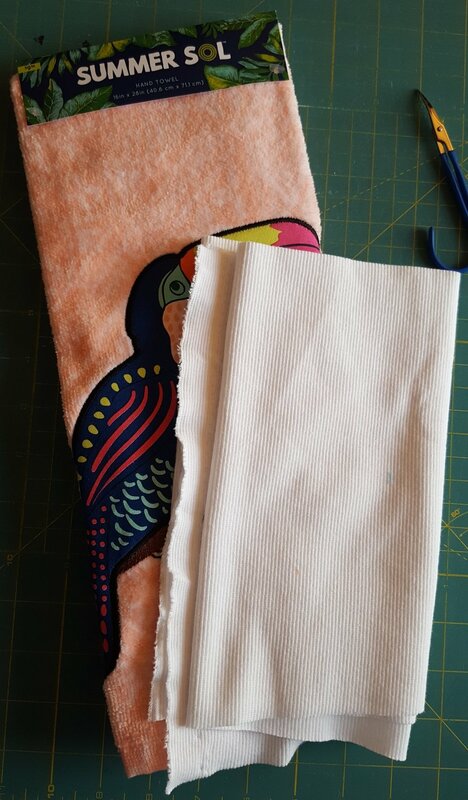 If you don’t have a serger; simply turn the raw edges of the fabric square under to the wrong side of napkin, twice, creating a small hemmed edge, and straight-stitch around the edges.